This research was motivated by the importance of interface management among organizations in collaborative management. 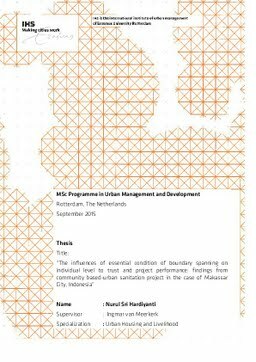 In this respect, this research focuses on boundary spanning in a community based-urban sanitation project in the case of Makassar City, Indonesia which community participation was required. Makassar City Government expected that the implementation of SPBM-USRI Project would be success. However, they faced different performance results of the project performance. I decided conducting this research based on the perspective of boundary spanning concept which is supported by some reasons: first, the form of collaborative management between local government and CBO becomes mainstreamed. Second, the collaborative management in SPBM-USRI Project required the interaction between CBOs and local government, in which the interaction is located in the complex situation. Third, previous studies have provem on the importance of boundary spanning activities in network managers or meta-governors as well as in the collaborative process to trust and the performance of governance networks (Williams, 2002, Gull, Rashid, et al., 2014, Klijn, Steijn, et al., 2010, Sørensen and Torfing, 2005, van Meerkerk and Edelenbos, 2014). In this respect, this research is aimed to contribute to the search for explanatory essential condition of boundary spanning activities on individual level which influences trust and project performance in community based-urban sanitation project. A single embedded case study is selected to conduct this study and a qualitative analysis is used to examine the relationship essential condition of boundary spanning activities on individual level to trust and project performance. As a result, this study founds some significant findings, as follows: the different quality of boundary spanning occurs due to the differences of boundary spanning result achievement; the presence as well as the integration of boundary spanning skills and competencies contribute to what extent the boundary spanning activities occur; a caused effect correlation of individual boundary spanner level condition to trust and project is determined by different quality of boundary spanning activities boundary spanners are recruited based on their functions to connecting people and connecting process across boundaries, and the implementation of community based project requires community leaders to act as an external boundary spanners. In condition when the community leader cannot act as an external boundary spanner, the recruitment will be held through an additional community meeting by considering the experiences and the intensiveness of those individuals connect and contact to government public managers. For future studies, I recommend to conduct similar study for other project sector. Besides, this is also important for future studies to conduct similar study by using different boundary spanning activities/tactics: buffering, reflecting and transforming. In addition, it is also important to conduct a similar study in the unit analysis where boundary spanners were located in same position, such as all external boundary spanners are community leaders.